There are some very, very strange animals in the world. Unfortunately many of these animals live in wonderful and strange places, and so are difficult to study. Most of the time when I want to blog about one of these creatures, I choose not to, because there’s just not enough information to make a decent post. Still, sometimes an animal is just too cool, and I can’t resist. 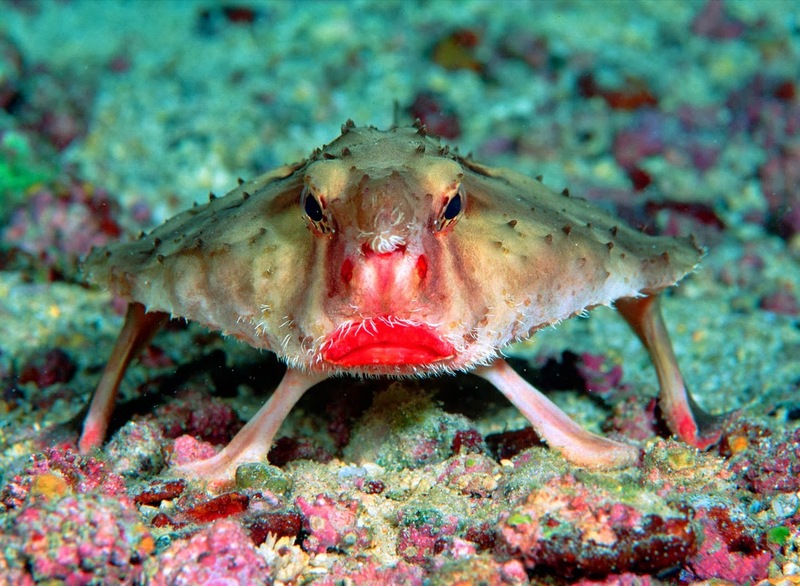 Such is the case with animal of today, the red-lipped batfish. There are two different families of batfish, but the one to which the red-lipped fellow belongs is Ogcocephalidae. They are bottom-dwelling deep sea lovers, and are called batfish because of their flattened bodies. The red-lipped batfish is even more descriptively named, as it has stylish bright red lips. They are pretty fabulous. Red-lipped batfish live on the sea floor near that ecological wonder, the Galapagos Islands. Is it any surprise then, that they are probably some of the weirdest fish out there? By far the strangest thing about the red-lipped batfish is its method of locomotion. Despite being fish and living in water their whole lives, red-lipped batfish are terrible swimmers. They don’t even bother with it. Instead, they use modified pectoral and pelvic fins to ‘walk’ along the sea floor. It looks pretty ridiculous. But I guess it suits these guys, for they seem to do fairly well, and are not currently threatened or endangered. So there you have it, probably one of the weirdest fish you’ll ever hear of. I go out of my way to find strange animals and still can’t get over how ridiculous the red-lipped batfish is. Hopefully you now appreciate them as much as I do!